Wednesday was the Snowpocalypse. After a decent snowfall on Tuesday, and a ton of snow still on the ground from previous snowfalls, we were scheduled to get about 15 inches of snow. Needless to say, schools were closed and everyone hunkered down. I wound up working from home since the commute into work would have been hazardous to say the least. B shoveled our walkway, sidewalk, cars and driveway out while I worked. She came back in, sore from the shoveling and I made sure that a cup of hot chocolate from our new Keurig was waiting for her. Sadly, I didn’t get to play with the boys as much as I’d have liked to. After all, I was “at work” even if I was technically in my bed. Before it got dark out, though, I decided to take a break from working, bundle up and head outside. You see, we have a problem with ice dams and so the snow on the roof needed to be removed. For those of you who don’t know what ice dams are, picture a roof covered in snow. The heat from the house warms the roof which melts the snow. The melted snow runs down the roof to the portion of roof that isn’t over a heated room. Since that portion of roof is colder, the snow re-freezes into ice. As more and more water runs over the ice, the ice gets bigger and bigger. When the ice dam gets big enough, the water can’t get over the ice and pools up. When this happens, the water can back up under the shingles and into the house. Needless to say, this is a bad thing. So out I went with my roof rake, a very long handled implement used to pull snow off from the roof. I did all around the house, but the best part was when I did the front of the house. JSL was able to see me from his bedroom window. Since I had little room to work in, the snow kept coming down on my head. JSL thought this was the funniest thing he had ever seen! Don’t take my word for it, though, B shot a video. See if you can tell where my pockets filled with snow. I didn’t realize this until much later. After I was done with this, I headed for the side of our house where I had to step in snow drifts that were, if you’ll excuse the expression, crotch-high. Nothing like being half-covered in snow to make you cold! 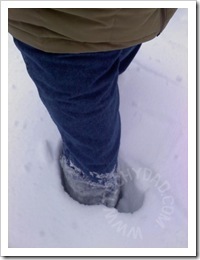 I had heard that snow was insulating and that tunneling in snow should keep you warm. Apparently, my toes didn’t get the memo though because they were going numb. Granted, that might have been because the snow went into my boot, melted and soaked my socks with cold water. part: walking in the backyard. As you might expect, we don’t shovel our backyard. 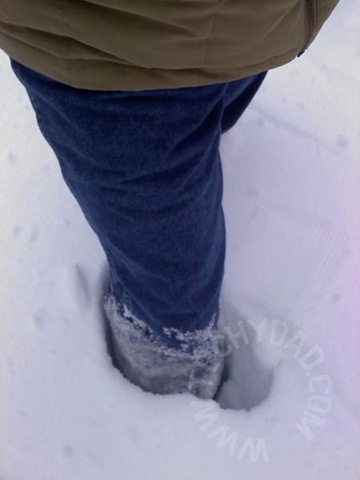 So this would show me just how deep the snow really was. So, how high was it? Knee-high, which for me is about 22 inches deep. Yes, we have a video of this too! I cleared our roof as much as I could before noticing that the roof rake had broken. Nothing major, just a nut that had come loose somewhere. (You think a needle in a haystack’s hard to find? Try finding a nut in a yard full of snow!) A quick trip to Home Depot today and the roof rake’s all fixed. Of course, after I was done roof raking, I had to go back and shovel up all the snow I had dumped off our roof. 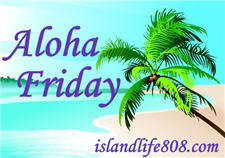 My Aloha Friday question for today is: Did you get any snow by you? If so, how much? Also, are you sick of the white stuff yet? 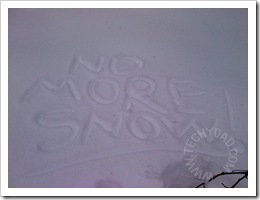 We have had several snows this year but each one only amounted to about 4 inches or less. I’m still enjoying winter. Every time I complain about the snow I think about you poor folks. I am so done! We only had about 4 inches and it’s all melted away now. We got a lot of ice it was terrible, snow I can take ice is terrible. That is a LOT of snow!! No snow here in Southern California though. I’m in Southern CA, so no snow here. 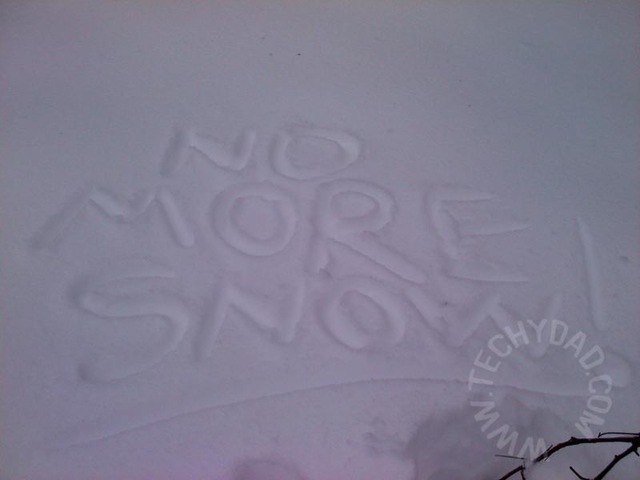 When I was younger I missed the snow (moved from MI) but when I see picture like this I don’t miss it one bit.